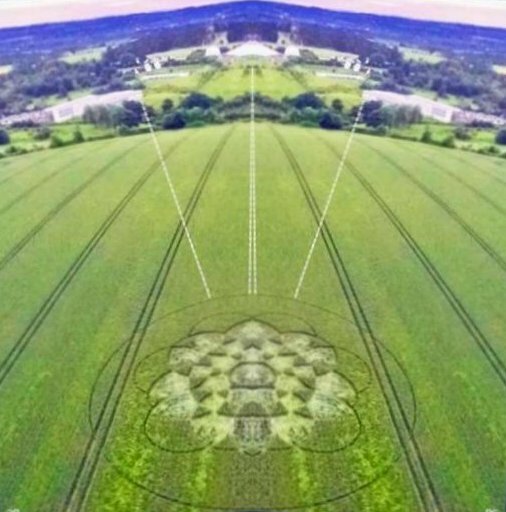 This new crop picture at Chilcomb Down shows a general-purpose template for creating "sacred geometry" of various kinds. 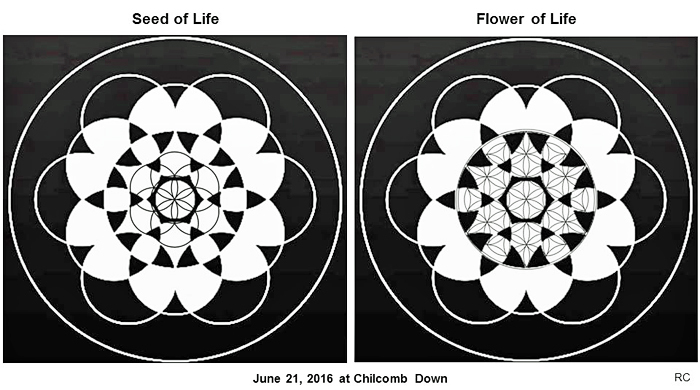 Three different examples of how to use this clever “template” are described below, for the “Seed of Life” or “Flower of Life”. Two different rotational orientations are most relevant, differing by 30 degrees. This wonderful new crop picture may have been meant as a “gift”, to help teach young children in the Winchester Science Centre nearby. Administrators of that centre, please open your minds and pay attention: seldom do we get high-quality teaching material from beyond Earth! I measured the area of the field flattened. There are one smallest circle at centre(a),12 middle circle on around(b), one large circle(c) and one more the largest circle(d) including all of them in it. I would prepare a wonderful twist at the end of this story. 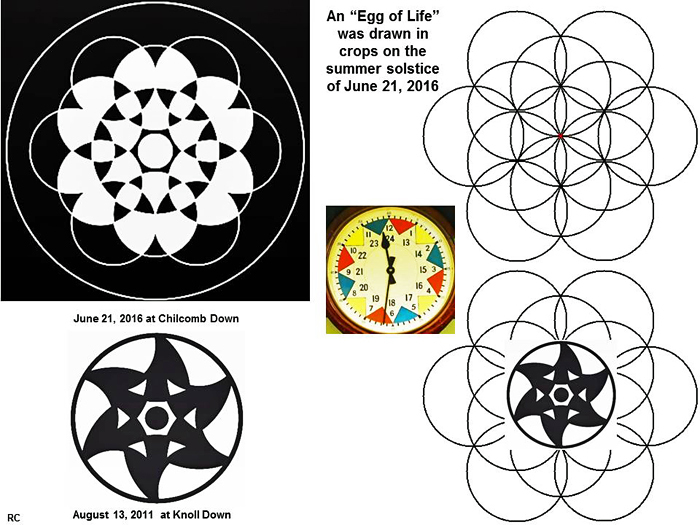 According to the Mayan calendar Tzolkin, 21st June 2016 is a day with the Solar Seal “Yellow Seed”. According to the 13-Moon calendar, 21st June 2016 is a day of the 12th Lunar month or 12th Moon with Tone 12 – the Crystal Tone of Cooperation. 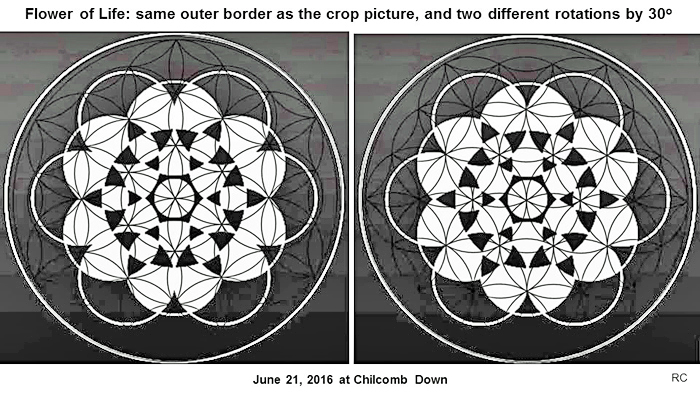 The crop cirlce resembles a blossoming FLOWER. On this way is depicted the energy “Yellow Seed” – the Energy of FLOWERING. 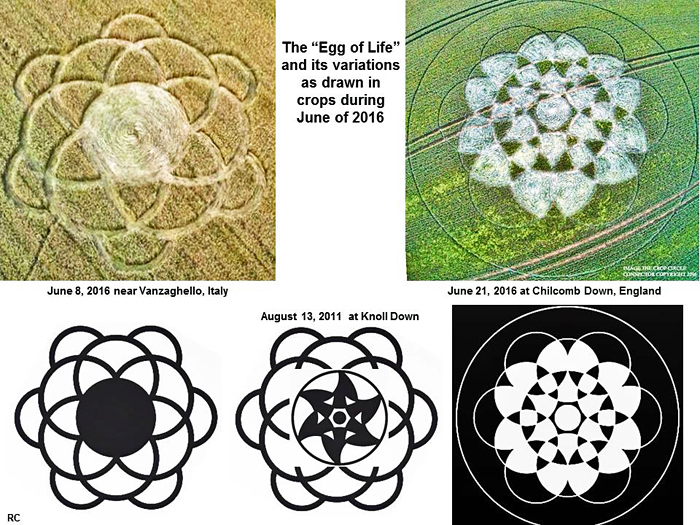 On the crop circles this energy is mostly depicted through small circles-"Seeds” or through Flowers. 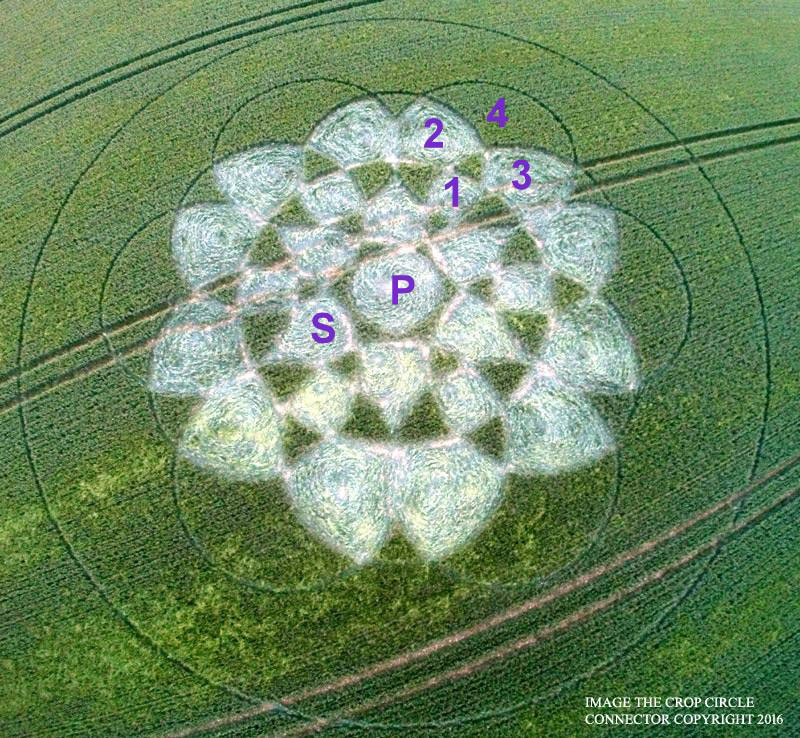 The circle "P" in the very center of the crop circle symbolizes a Portal. 21st June 2016 is a Galactic Activation Portal Day. Round this circle are depicted 6 “Seeds”, marked through the letter “S” on the image. On a day with the Solar Seal “Yellow Seed” we plant “Seeds”, which will grow and blossom. The Seeds are our Thought-Forms, for example for Peace, Harmony and Prosperity for all people on the Earth. We can “plant” such Thought-Forms/Seeds for different things on personal and on social plane. The figure, which consists of the elements 1, 2, 3 and 4 on the image, resembles a human face with big eyes. On this way is depicted the energy “Blue Eagle” – the Energy of VISION. The elements 2 an 3 are the eyes, 1 – the mouth, 4 – the forehead, between 2 and 3 is the nose. We can say, that these 6 human faces symbolize the Humanity. There are 12 elements from type 2 and 3. Here the number 12 symbolizes Tone 12 – the Crystal Tone of Cooperation, the Tone of the current 12th Moon. 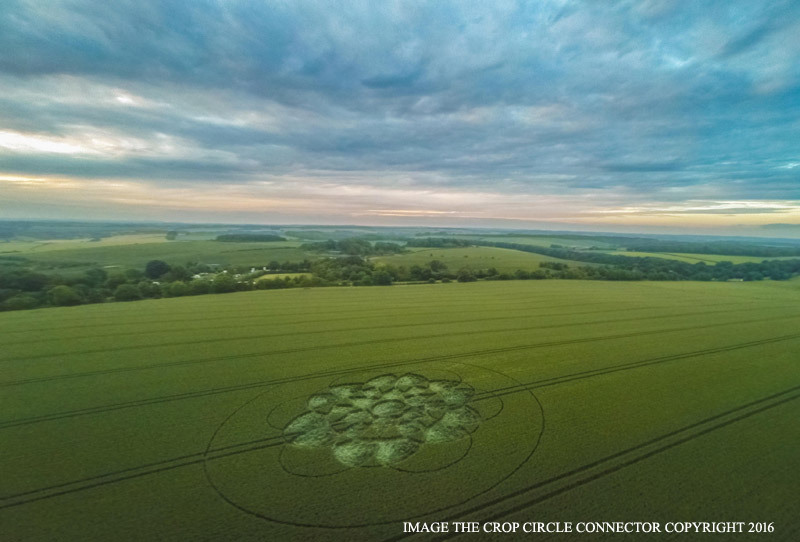 In my opinion, the designers of this crop circle remind us to use the energy of the Blue Eagle – the energy of the VISUALIZATION. 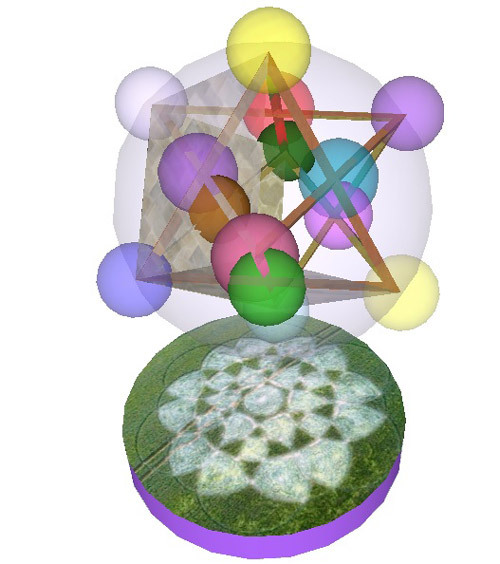 The Visualization is a powerful energy tool for Creation. The energy Blue Eagle teaches us also, that we have to unite ourselves, to think about the collective. Tone 12 – the Crystal Tone of Cooperation – teaches us to strive for cooperation with the other people. Only in Unity and in Cooperation we can achieve a reality, where all people live in prosperity, where each person can develop his full creative potential. The outer circle symbolizes the Earth and on this way is represented the energy Red Earth. 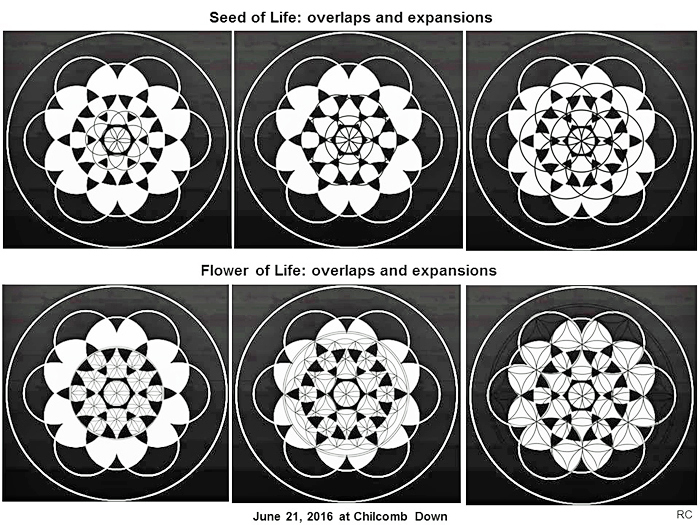 And the central figure, which resembles a blossoming FLOWER, symbolizes a PROSPERING HUMANITY ! What a wonderful VISION !! 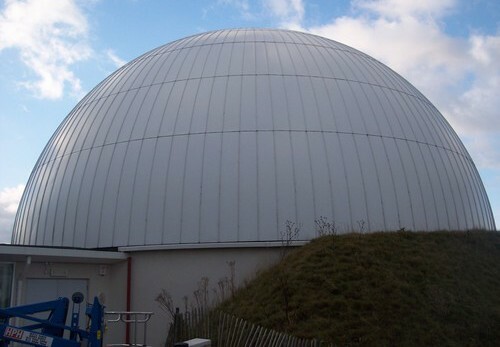 The formation expresses this planetarium. It refers to the stars in contrast to our own star: the sun. The earth and all other planets revolve around the sun. This is why people usually adore the sun, not realizing that the sun is just a star as billions of other stars. In the West, astrology relates to the sun, as the beginning of the zodiac (0 degrees Aries) is by definition the spring equinox on the northern hemisphere. This is called the tropical zodiac, but the tropical zodiac in fact has no connection with any constellation at all; for example on March 20 (spring equinox), the sun is in the constellation Pisces. It is very well possible to define the zodiac in such a way that there is a true relationship with the stars that will not change over the course of several centuries, as is the case regarding the tropical zodiac. Astrologers call this the sidereal zodiac. 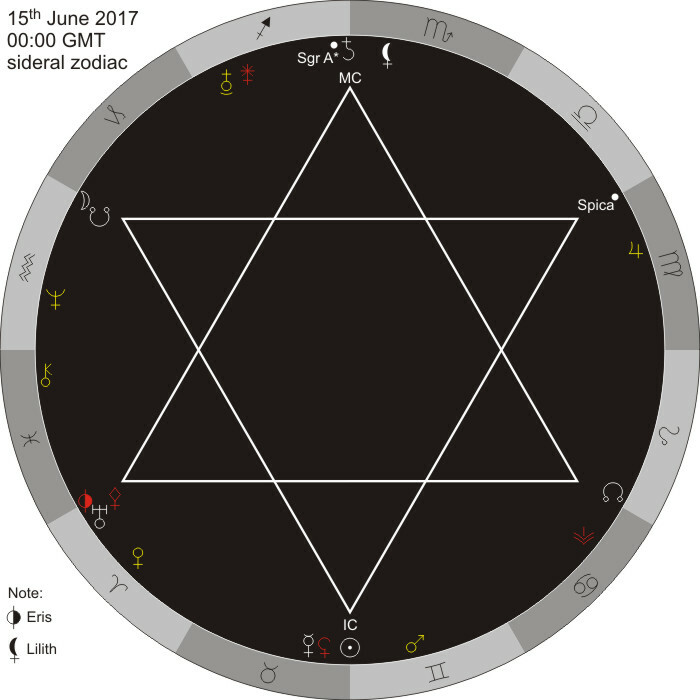 The sidereal zodiac is still in use in India, in Vedic astrology. According to Vedic tradition, the star Spica is by definition 0 degrees Libra. The formation points us to the stars by the nearby planetarium as well as the design of the crop circle formation itself. 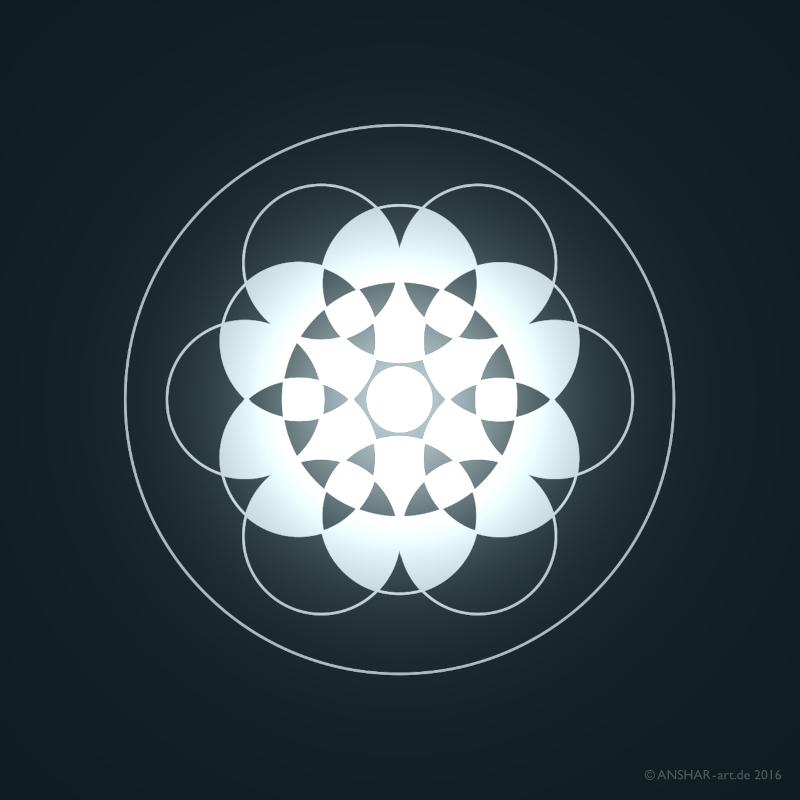 The formation divides the circle in 6 or 12 parts; they relate to the 12 signs of the zodiac. When we assume that the formation was created in the night of June 20 to 21 around 00:00 local time, the formation was created at the very moment that the sun entered the sign Cancer according to the tropical zodiac. This is also the astronomical start of the summer (the shortest night), which closely relates to the tropical zodiac. This figure displays all usual celestial bodies, including the four most important asteroids, Eris (both in red), Chiron, the lunar nodes and Lilith. While the sun is at the nadir (IC), Saturn is at midheaven (MC), close to the centre of the galaxy, the supermassive black hole of Sagittarius A*. The other points of the six-pointed star also precisely correspond with one or even more important points (celestial bodies or the lunar nodes), except the point around 0 degrees Libra. However, this is exactly the reference point of the sidereal zodiac and by definition the position of the star Spica!! This also clarifies that Spica still is the reference-star for the true sidereal zodiac. This is important as a lot of confusion arose in the fifties of the previous century, when some astrologers in the West started to use a slightly different kind of “sidereal zodiac”, deviating from Vedic tradition. 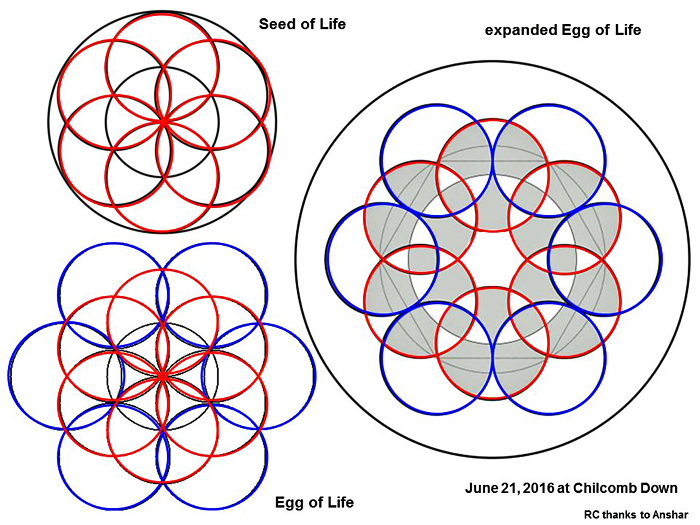 The reference to June 15, 2017 probably also means that by that time people will be reconnected with the stars again and the tropical zodiac will lose its significance. Planet Earth finally will give no place to an ego-minded humanity. I’m sending your readers a right and left mirrored image of this formation. Get your magnifying glass out readers, as you will need it to see the symbols! In this first image you can now clearly see the face of a human lion. I say human as the mouth of this lion is very human looking. 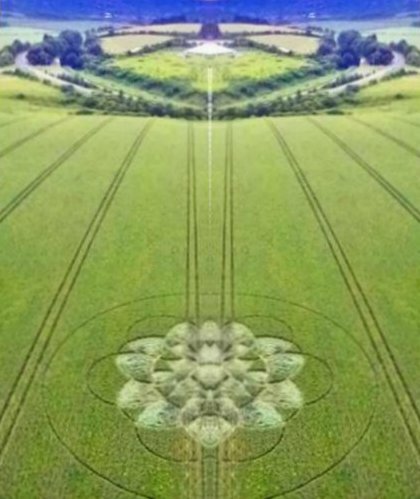 Take note of the lines that appear in the crops as they now meet with this lions eyes. Notice now that the land in the distance has become heart shaped. And also just slightly above the pointed tip of the heart shaped land there is a sort of launching pad as above it now hovers a white spacecraft of some kind. This craft is either just landing or its just taking off? But the question is just who is this human lion? What are those in the heavens trying to tell us? In this mirrored formation there now appears now some kind of symbols. I personally don’t understand any of these symbols. Take note that there is now the figure of a man in the oval shape that is in the centre bottom of the formation. The photo indicates geometrical defects and possible manmade status. We have an inner ring of six circles plus an outer, larger ring of six circles, a central circle, and a single impact circle in the center. Similar designs occur with GBR (07/07/19), pg. 160, and GBR (11/07/03), pg. 278. The 12 circles and impact area suggest Comet E. The black and white areas would refer to the relative portions of gas and solid matter, and/or the portions of the 12 fragments falling at day or night. Download the free ebook at http://theheckhypothesis.com/aboutthebook.html for the page references.